Hanoi attaches importance to cooperation projects in climate change adaptation and environmental protection between its Hoan Kiem district and Lichtenberg district of Berlin, Germany, said Chairman of the municipal People’s Committee Nguyen Duc Chung. The Hanoi official made the statement during a reception on October 31 for Michael Grunst, Chairman of Lichtenberg district who is leading a delegation to Hanoi to explore cooperation opportunities with the Vietnamese capital city. The municipal authority is interested in these areas of cooperation, and always supports and appreciates the expansion of twin relations between Vietnamese and German localities, Chung said. He affirmed that Hanoi always welcome German businesses to invest in and cooperate with those from Hanoi. For his part, Michael Grunst applauded environmental projects of Hanoi, including those to plant 1 million trees in the 2016-2020. 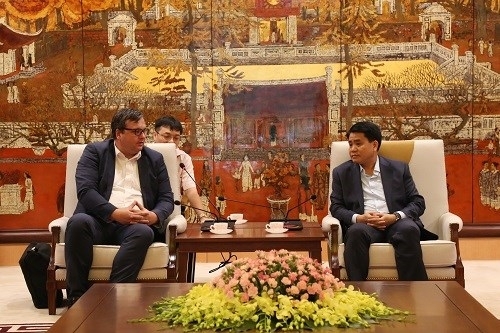 He briefed his guest on cooperation between Lichtenberg and Hoan Kiem based on an agreement signed in 2015 between the two sides, expressing his hope that the Hanoi authority will support and facilitate the two localities’ multi-faceted collaboration in the time to come. He stressed that apart from cooperation in combating climate change, the two sides should to expand their collaboration in other fields such as tourism and trade.